Many of the equine pastures that we’re called out to inspect have been subjected to a well-meaning approach that may have supplied short-term benefits but has created more problems than it solved. This approach is often presented as a ‘solution in a bag’ – where a merchant wants to sell you something, typically an expensive fertiliser or grass seed. It will probably deliver what it says, but is it exactly what your soil and grass need to sustain productivity for your horses? If you think that any equine pasture is a complex interaction of soil, water, air, plant roots, microbes, organic matter and temperature, then one solution is unlikely to suffice. On too many occasions this fertiliser or grass seed is totally inappropriate for your horses’ needs. The other major problem I am often faced with is that paddocks have been ploughed and re-drilled with totally inappropriate grass mixtures for the horses. During and after World War 2, the need to increase food production – by planting predominately cereals and potatoes – meant that many acres of grassland were ‘ploughed out’ so that the land could be cultivated for arable production. Using the small, relatively light, tractors of that era with three or four furrow ploughs meant that structural damage to the soil was minimal. Most pasture that was destined for ploughing would have inherently had a fantastic structure and organic content, created over decades of the cyclical growth and decay from the grass. This rich environment would have been complemented by grazing animals depositing faeces. This cycle cumulated in a steady increase in soil microbial and worm activity creating a highly productive soil that could withstand the ploughing and stay productive. The problem we have now is that same philosophy is applied to modern soils. In all likelihood, if you ask a farmer what to do with an unproductive pasture he will say ‘plough it out, and start again!’. Please, please don’t do it!! Nothing kills modern soils faster than a plough. Arable yields have remained static for the last decades because the organic matter and life in the soil has been buried out of sight. And now so many arable soils are virtually lifeless, but easy to work and drill with modern machinery. What happens when a plough is put though a grass sward? Soil consists of sand, silt and clay in varying proportions, along with any stones. This mixture will be complemented with worms, microbes and the essential organic matter that all serve to give a soil life and make it productive. When the plough goes through the soil it acts like a sieve and all the valuable small particles (clay, silt, humus and organic matter) fall through the soil profile out of reach of the roots, and lumps of inert material are brought up. That isn’t a good situation for creating long-term productivity! Repeated ploughing compounds this negative cycle. 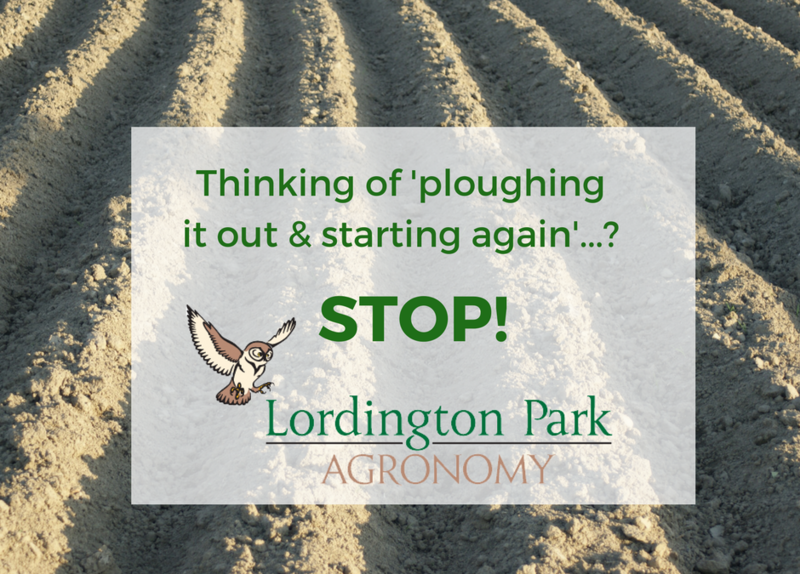 Yes, ploughing lets air back into the soil and creates a tilth for seed-to-soil contact. But the long-term damage will take years, decades even, for the worms and the microbes to re-structure and sustain productivity. Consider that the sward (upper layers of soil and grass) will usually have existed for many years, and consequently created an environment that is perfect for grass productivity. This productivity will be due to the complex interaction of the worms and microbes within the soil and the exudate on the roots, which enables the grass to access soil borne nutrition. What is the alternative solution to ploughing? The solution is to let air back into the soil with a chain-harrow, or modern equivalent. Then, once the current grass is very short use a slot-drill to establish your new species straight into the sward. Perfect! I would strongly suggest that an Albrecht soil analysis is carried out BEFORE this re-drilling is done so that remedial action can be taken to balance the soil to encourage long-term productivity once the grass is drilled. This analysis will also allow a grass species mixture to be selected that complement both the objectives of the horse owner and that will also flourish in that specific soil. Grassland takes time to nurture and develop. There is rarely a ‘quick fix’ as with so many other things in our modern society. Get in touch to discuss your grassland.